I believe people like to feel special. That can be inherent, or it can also be an outcome, like when someone buys you flowers, or compliments a job well done. Special feelings are, in my view, sort of a superpower in nonprofits — we have the ability to be transformative with our work. And sometimes, if we’re lucky, we are fortunate enough to receive donations as a result of that work. When that happens, we should always share our appreciation with those donors. There are innumerable ways to steward philanthropy, but one pretty typical, immediate standard is a thank you note. I hear a lot of debate on whether those should be paper, email, postcard, etc., but whatever you choose, please for crying out loud be accurate. Know if the recipient is a man or woman, if their spouse is alive or deceased, or if they’re Michele with one “L.” Above all, have a system in place that allows you to be vigilant about what goes out the door. Not my name, but literally “Dear [donor],” which I’m guessing was the likely result of a lazy mail merge. If that weren’t egregious enough, it was as form a letter as you could find. No mention of my specific gift amount, no messaging about how it supports the mission, no EIN (tax number) for me to keep on hand for tax purposes and — to bring it all home — the letter was a photocopy. #SMH, or so the kids would say. So let’s do better by our most trusted supporters y’all, okay? There are too many organizations out there they could support, but they chose ours, so let’s act like we care, all right? At some point in my career I became painfully aware of a phenomenon called the Dunning–Kruger Effect. Psychologists David Dunning and Justin Kruger coined the phrase in their 1999 paper, “Unskilled and unaware of it: how difficulties in recognizing one’s own incompetence lead to inflated self-assessments.” Essentially, they posit, sufferers are ignorant of their own ignorance. Now, who hasn’t worked with someone like this? You know the type. When they walk down the hall, colleagues run the other way; they burn through staff at rapid pace; they’re quick to throw anyone under the bus — and they do it all with great gusto. Maybe it’s just my luck, though I’ve had several managers like this throughout my career. After a while I began theorizing why, and this was my hypothesis: Some people find themselves in leadership positions because of particular skills, not necessarily because they are fit to lead. An example might be the artist who ascends to the position of executive director because of their creative savvy, while lacking budgetary or philanthropic competencies. Or the development staffer who raises a ton of money and climbs to #1, without understanding the nuances of human resources. Leadership is a sticking point for me (see here), and that Dunning-Kruger Effect is all over nonprofits, often in top positions. And while I’ve experienced my share of those who act heinously because of it, I’ve also seen people who admit they don’t know what they don’t know, and learn from it. I LOVE working with people like that, and I bet in turn they find me to be a pretty happy colleague. I don’t work for a Dunning-Kruger sufferer now, and I hope never to again. I know they’re out there, though, so if you come across one, feel free to print out this post and leave it on their desk — it’s likely they have a lot of work enemies, so they probably won’t know it was you anyway. Words have meaning, and they matter. You wouldn’t know it by looking around these days at business leaders, politicians and the likes, but they do. In nonprofits, we have lots of words and phrases, and in my view, a good number of them are overused. Here are a few in our lexicon I think we can do without — not comprehensive by any means, and if you have others, please share them! Touch: In the 80s I think it was okay to talk about engagement with constituents as “touchpoints,” but… now we live in a different time. I read a recent annual report from an educational nonprofit, noting they “touched” 10,000 children through their programs. I might just be a focus group of one, but for me that’s a big old #FacePalm. Community Outreach: It’s as bad a phrase now as it was decades ago, and it has a smarmy feel of the “haves” giving something to the “have nots.” What’s worse, it makes the gross misassumption that the “have nots” actually want it. If you must, call it “engagement,” but only if you really mean it. No one wants your pity outreach, and even less people are funding it these days anyway. Curate: This may be my bias having spent far too many years nonprofiteering in the arts, but curating is a verb best suited for museum folk. We — the purveyors off programs and throwers of events — do not curate things, we offer experiences — experiences in which our constituents participate and, hopefully, enjoy. Let’s Brainstorm: Let’s not. Why? Because at the end of this faux exercise, we’re just going to do what you want anyway. So why don’t you just give me some marching orders so I can get back to laughing at memes on my 30-minute lunch break. Um: This is more of a public speaking matter, but it has to go. In my view, our field is the field with heart, and when we talk about our work, we want to do so intelligibly, and with warmth and passion. Inserting “um” every seven words makes us sound immature, uninteresting and unprepared. Slow down, have a Coke, give your brain a moment to prepare the right words, then proceed. Nonprofit Rate: Call it a charity rate, a discount or any number of things — either way, it’s nonprofit speak for “cheap.” It’s one thing to have a budget, but if you can afford to pay for something, please don’t request it for free. Statements like that are what give our industry an unnecessarily bad name. Let’s Revisit This Later: What exactly is wrong with visiting this right now? 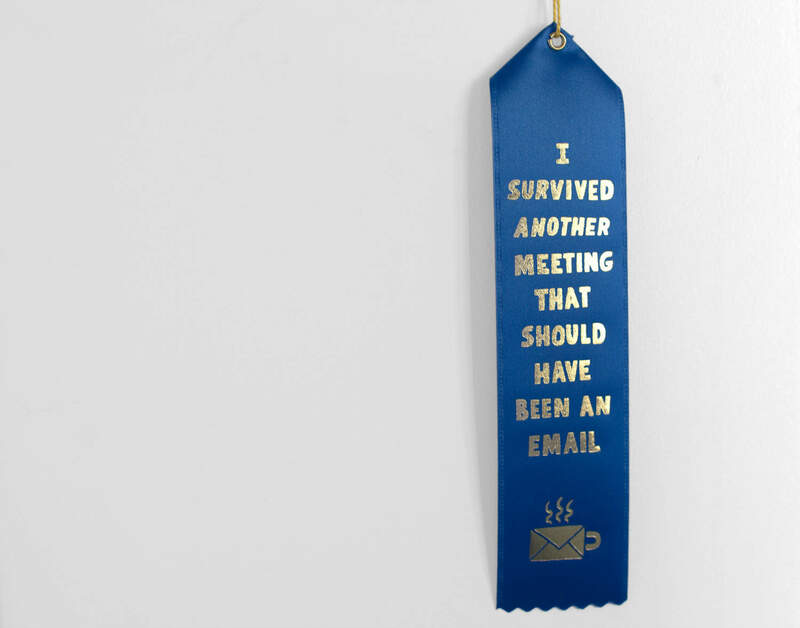 Apart from the fact we have too many dang meetings that could have been e-mails, there’s no time like the present to discuss the thing we’re already discussing. So can we please save future time for future things, and have the darn conversation right now about which awful shade of yellow the gala invitation will be?